"St. Joseph's Parochial School was built under the guidance of Father Florence J. Halloran. In addition to overseeing the building of the school, he was responsible for a mission chapel built in Lynnfield in 1922 the Chapel of the Most Blessed Sacrament (1928) and the Santissima Maria del Carmine Society chapel on Water Street, a mission of St. Joseph's Church. A new parish was formed in 1947, named in memory of Father Florence Halloran who passed away on March 26, 1947. St. Joseph's School opened on September 9th, 1925 with 92 students in the first and second grades. The school was staffed by two teachers and a music teacher, all Sisters in the Order of St. Joseph. A grade was added each year. 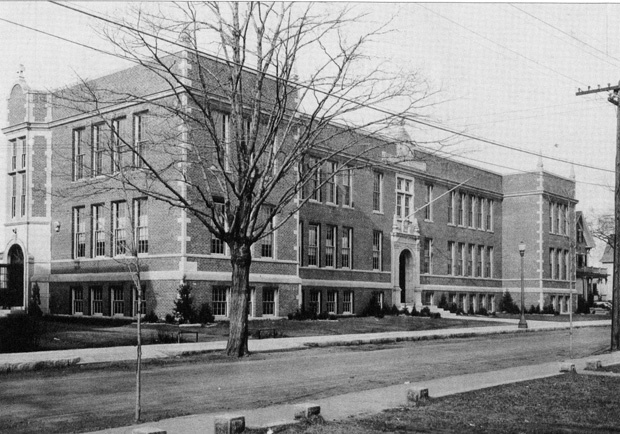 The building had 11 classrooms, six which were occupied when the school year began in 1929. The building was described as 'architecturally beautiful...the structure is of waterstruck brick with trimmings of cast stone at the entrance and at the pinnacles.'" -- Text from calendar by Jayne M. D'Onofrio. “St. Joseph's Parochial School, circa 1930,” NOBLE Digital Heritage, accessed April 20, 2019, https://digitalheritage.noblenet.org/noble/items/show/7080.